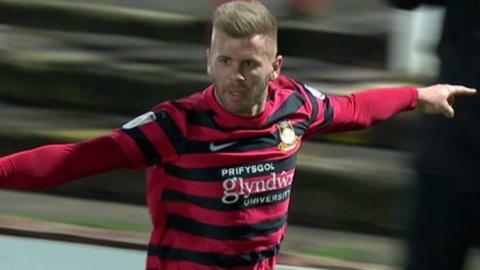 Wrexham striker Andy Bishop hopes his side are drawn against Manchester United in the FA Cup third round. Bishop, 32, scored twice to help Wrexham beat Maidstone 3-1 in the second round on Saturday. The draw, which sees Premier League and Championship clubs enter, will take place on Monday, 8 December. "Man United away - that's what I am hoping for," said Bishop, adding: "I'd love to go there, get a draw, come back here and get the win." He added: "I'm getting on a bit in my career now so it's still that chance, that dream of getting a big club in the Premiership. "You've always got to believe, that's what the FA Cup is all about. It's the best competition in the world." Wrexham survived a spirited second-half performance by 10-man Maidstone at the Racecourse. The Dragons coasted into a 2-0 lead thanks to goals from Manny Smith and a Bishop penalty, but Alex Flisher's second-half strike for the part-timers set up a nervy finish, before Bishop secured the win. And the Dragons striker says a glamour tie in the third round against the likes of Manchester United would boost the club's finances. "Obviously it would be brilliant for the club but I think any big team, Wolves, Stoke, anyone around this sort of area, where you're going to get a sell-out is good for the club," he said. "It means a lot with a club this size. The money you are going to generate from it is a massive help." Bishop says the FA Cup run could also help Wrexham's efforts to return to the Football League. Kevin Wilkin's side are 12th in the Conference after just one win in their last 11 league games. "That bit of extra cash might bring one or two players in," said the striker. "Those one or two players could really help with the promotion push. I don't think we're too far off at all. "Obviously, we've got to start picking up wins in the league, but if we take this sort of form in, I think we'll be alright. The draw for the FA Cup third round will be televised on BBC Two from 19:00 GMT on Monday, 8 December.